I have friends and family all over Arkansas, and one side of my brother’s family comes from Searcy County. So I have been familiar with the Daisy Queen since my adolescence. 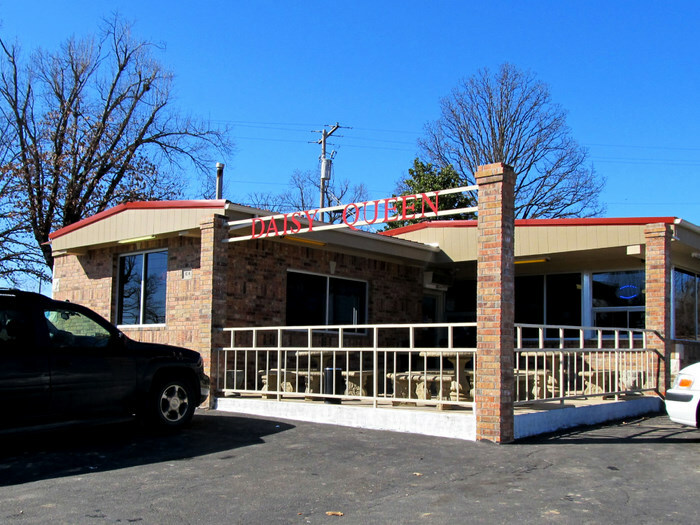 The little dairy shack on the east side of Highway 65 in Marshall has received a little facelift here and there over the years, but it’s still serving up burgers, shakes and all the things a little community like Marshall might want to eat. I stopped in on my way back from a trip further north recently to enjoy a classic burger and kick a little road dust off my shoes. Almost changed my mind when I saw the men. It’s been a little while since I dropped in, but I had forgotten about the variety of items at the place. 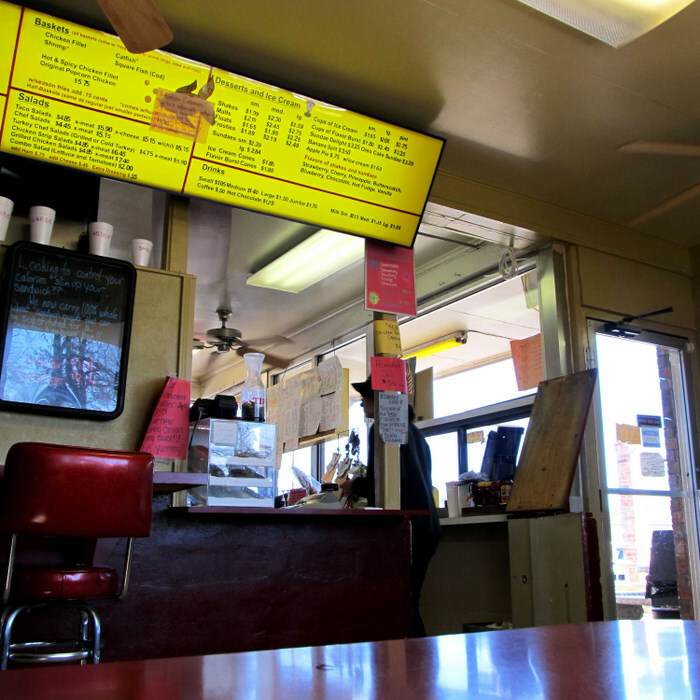 The menu is posted overhead on these old yellow signs, completely packed with dining options. And then there are whiteboards below with even more options. What’s offered? -- and then there are the ice cream offerings -- shakes, malts, floats, frosties, sundaes, cones, Oreo cake sundae, Sundae Delight, a banana split and an apple pie a la mode. Shakes and malts and sundaes come in strawberry, cherry, pineapple, butterscotch, blueberry, chocolate, hot fudge and vanilla. I haven’t even made it to the burgers. They come in single, double or triple sizes, with or without cheese, bacon or chili. 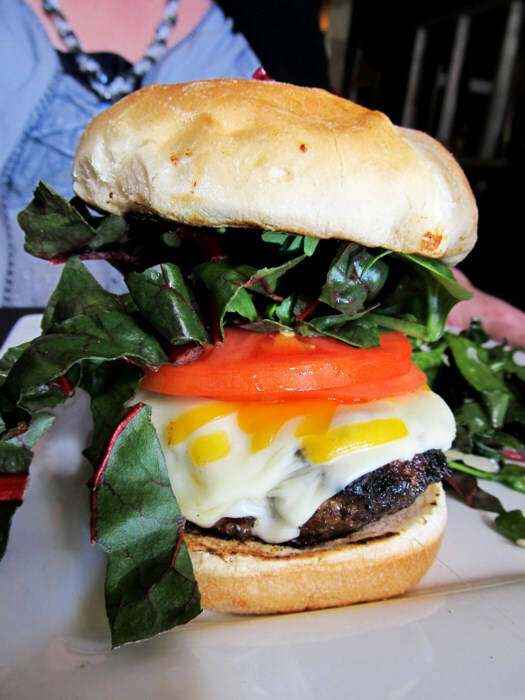 And there’s something called Jeff’s Bigmouth Burger (8 ounces of Fresh Angus for $4). I won’t even go into the kids’ meals, the chips, the beverages (except to say they carry a large number of diet beverages) or such. Lots of options. I bet the menu is so large because Marshall doesn’t have a whole lot to choose from when it comes to dining. There’s a Pizza Hut and a Subway north up the road, and a little diner south a bit. And there’s the Harp’s grocery store and a couple of convenience store. All these things have come and some other things have gone since the Daisy Queen opened in 1966. So, about my lunch. I ordered and had a seat, relaxing a bit. It was a Sunday afternoon and there were a few people in the place, including a family of four that were sharing burgers and onion riings at the next table over. The lady I’d ordered from at the counter called me over and handed me my iced tea and I enjoyed a few more moments soaking up sunlight coming in the west-facing window. And then she got my attention again and passed over a red tray. On that tray were two wax-paper wrapped bundles. One of them contained some hot fresh battered and deep fried mushrooms with some Ranch dressing in a little cup. 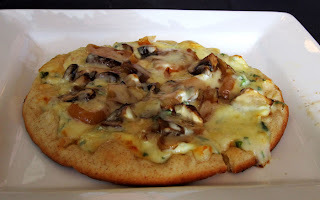 I knew the mushrooms were likely from frozen, but they were good and hot. And they were cheap, too -- $1.40 for a tray of eight. And then there was the burger, pretty much unchanged from the sort I’d had as a teenager. 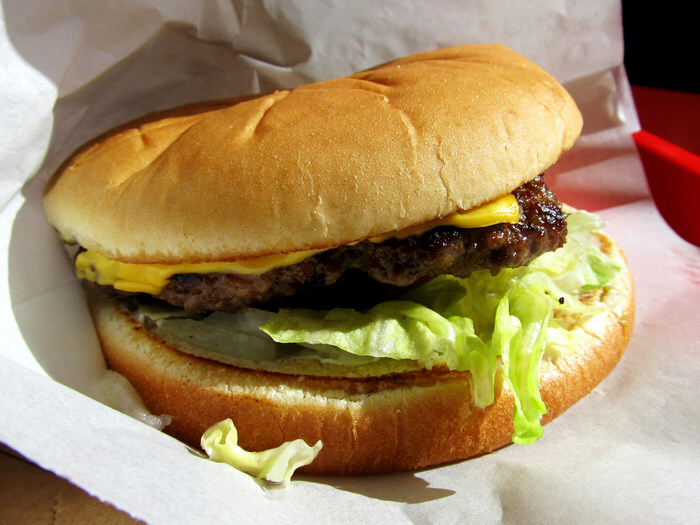 The seedless bun had been lightly toasted on the griddle, the salt-and-pepper seasoned patty topped with a slice of American cheese and allowed to melt before being placed on top of the stack of vegetation on the bottom bun -- top to bottom dill pickle slice, tomato slice, iceberg lettuce and white onion. Mayo was the default condiment. And that burger had the flavor of a consistent favorite, with just the right amount of griddle char on the meat and the right amount of mayo skimmed onto the bottom bun. 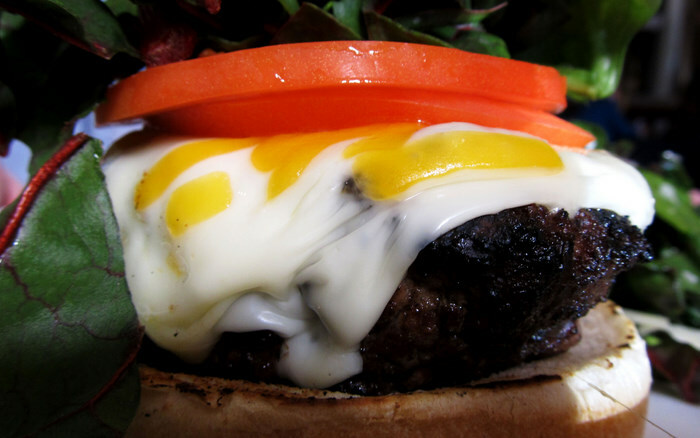 The folks who make these burgers could probably make them in their sleep. 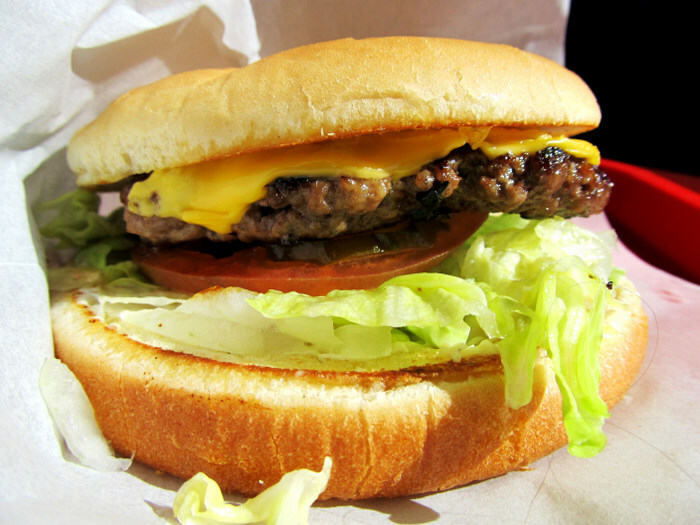 It’s a classic quarter pound of drive-in delight. 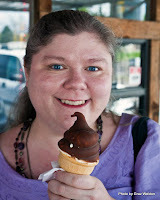 If I had not been watching my calories, I might have made it out of there with a chocolate malt, which I also remember as being quite splendid from my younger years. As it was, I took part of my meal on the road with me. 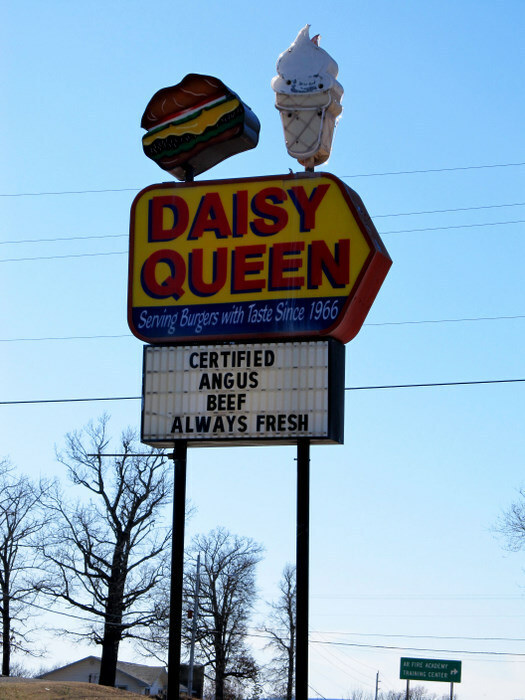 Daisy Queen is located on highway 65 North in Marshall, within spitting distance of Harp’s. It’s open 8:30 a.m.- 9 p.m. Monday through Thursday and until 10 p.m. on the weekends. (870) 448-2180. I grew up in southwest Little Rock. During the week, it was the central portion of my world. I went to Geyer Springs Elementary, lived off Gum Springs and had friends that lived from about where I did out down south to far out on Arch Street. Now, we’re not talking about the downtown portion of Arch Street that passes some of the most important real estate in the city. We’re talking Arch Street that used to be “out in the county;” i.e., the area beyond the gravel operations. Arch Street did and still does meander from 65th Street down past Baseline and way out to the edge of the county, through some of the more scenic rolling hills and timberlands. Most of the businesses that lined the thoroughfare in the 70s and 80s have dried up and disappeared, but one place we grabbed many a milkshake at still stands, changed very little since those times of my youth. That’s The Spot. 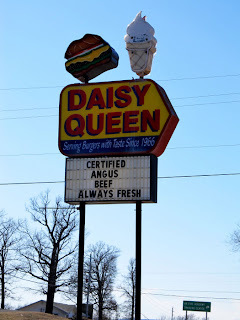 Indeed, people still hit The Spot to this day, as I did one day this week, just to see if the place was still serving up shakes and burgers like it used to. It was a remarkably warm March day with temperatures nudging 80, and as I pulled up I discovered finding a parking spot would be a challenge. There were more than a dozen cars on the lot. That’s saying something for a place with no indoor seating and very little outdoor seating. In fact, the only places to sit besides the ground are on one of two weathered benches (assumingly reserved for people waiting for their orders) and a couple of picnic tables way off to the side. It’s a red building with two windows, a pull-up and a sign out front, situated on a gravelled lot. And it smells like burgers when you drive up. I found my parking spot, got out and went to the front, where I was able to walk right up to the window. There were at least a dozen people quietly waiting on their orders, some in cars and some standing around. Numbers were called, orders were collected and people left. Other people came. I barely glanced at the menu, just ordered a Jumbo Cheeseburger ($4.05), onion rings ($2.30) and a small Pineapple Shake ($2.25, medium $2.85, large $3.35). I walked around in the spring air, took some photos and looked around. Outside of the new sign out front and the new paint job (which is probably a few years old), nothing had really changed. Not even the menu. It’s still burgers, a chicken sandwich, a steak sandwich, barbecue sandwich (the sort that comes from a bucket) and ham sandwich. They still sell chicken and fish dinners, too -- though no one I saw that day ordered one. They still do a taco salad too, and nachos, and a super salad with all sorts of stuff on it. I think they’ve added the cheese sticks and stuffed peppers in the 20 or so years since I last dropped by, though. While I was waiting, a woman went up to one of the windows and asked if they had steak sandwiches that day. She ordered it with a large banana shake. Right after she’d placed her order, they called me to come get my pineapple shake while they finished the rest. My small shake was 16 ounces (medium is 20, large 24) and thick, but not too sweet, a blend of soft serve and canned pineapple. I was really ready for that. I wish I hadn’t given up cola for Lent, because they do fountain Cokes there and they add cherry or vanilla or both if you want them. Wasn’t too long until my number was called. I took my bag and headed for the car, there to unwrap my spoils and check out the consumables. 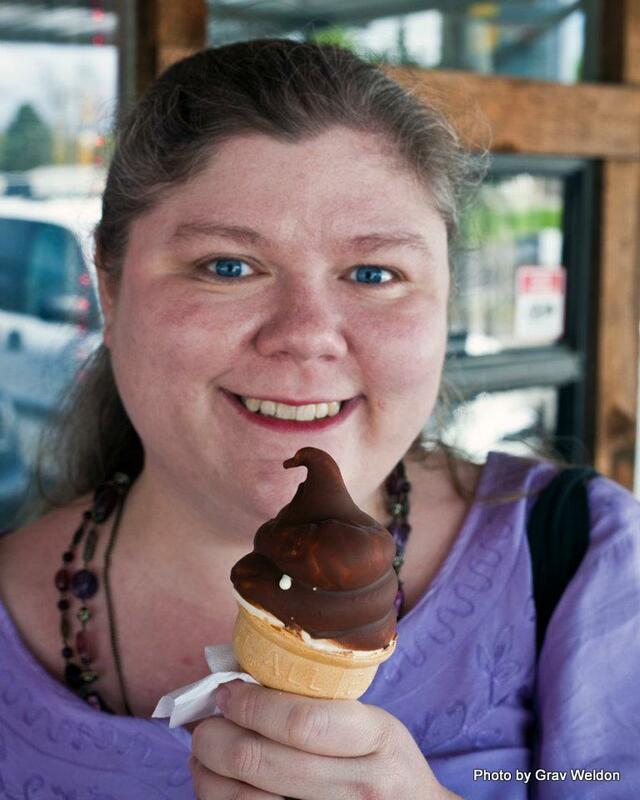 What I discovered was a large wax paper-wrapped bundle of onion rings that had been set closed with one staple and a wax paper wrapped burger secured with a toothpick. The onion ring bundle was huge, larger than the burger and heavy. 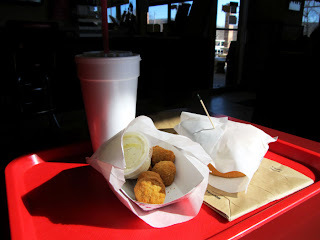 The onion rings inside were thickly battered and deep golden brown. 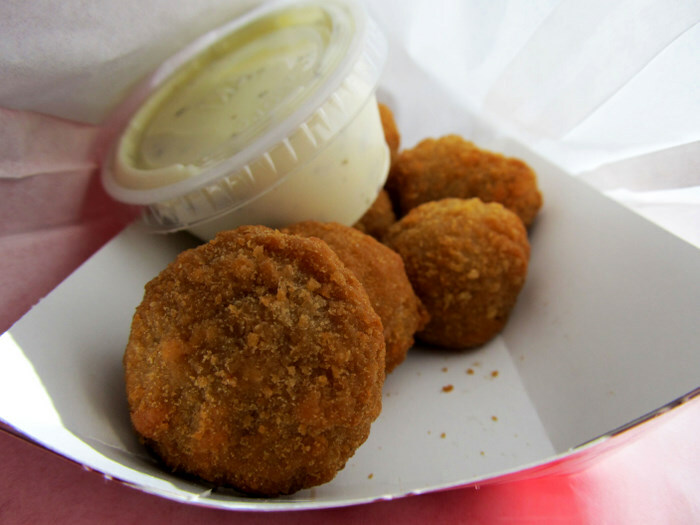 The onion bits within that battered coating were translucent and soft, pliant and juicy. If I could fault them anything, it would be that they could have used a touch more salt -- but then again, I could have asked for ketchup to dip them in. That would have worked, too. 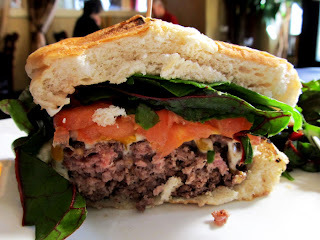 The burger... a half pound griddle smashed patty with an impossibly crispy crust. That’s right -- the surface of the burger was crispy, as if it had been cooked in a perfect layer of grease on a hot griddle. Which, I’m sure, it was. Surprisingly, it was very low on seasoning, with just a hint of salt to it. But the beef was high quality, which made all the difference. The barely toasted top bun rested directly on top of the patty, which was oval-shaped and quite certainly hand patted. Under the patty, in order: a slice of American cheese, ridgy dill pickle slices, a tomato slice, iceberg lettuce, very fresh white onion and a slight slathering of mayonnaise. The bottom bun was buttery toasted. Even without mustard (mayo is the default), this burger retained a tartness in its complexity, thanks to the liberal application of the pickle slices. Furthermore, it had a nice meaty bite to it, with a strong assist from the pungent onions. The cheese was just overwhelmed -- though I suspect that has something to do with the lack of meltage. All in all, a good burger. And the rings were good, but I could not finish them -- not because they lacked in their goodness, but because of their plentitude. There were easily a dozen big fat rings in that wax paper. The Spot has been on Arch Street there for more than 50 years. It has a steady clientele and a lot of character. Glad it came to mind the other day... that’s the good kind of trip down memory lane. You’ll find The Spot at 11320 Arch Street. It’s south of Dixon Road, so you can either get there from I-530 via Dixon, take Baseline out as far east as it goes or take 65th Street as east as it goes and head south. It’s open Monday through Saturday 11 a.m.-7 p.m. except Tuesday, when it closes at 2 p.m. Closed on Sunday. (501) 888-5333. I'm a lucky girl. I've been able to try so many neat and unique dishes over these past several years. 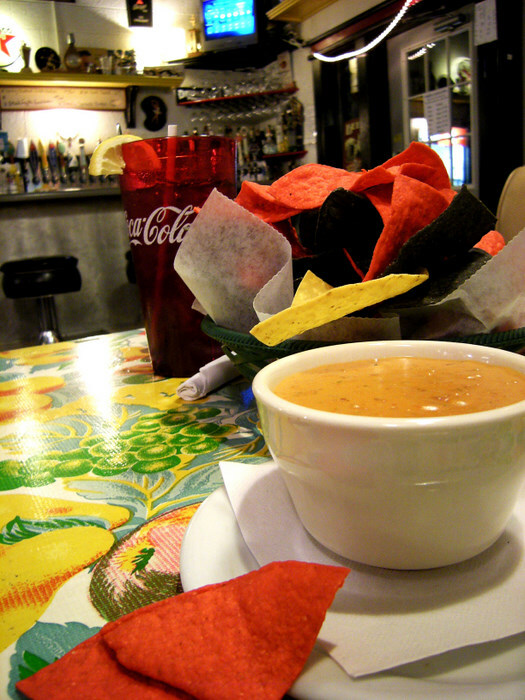 And there are few dishes that represent Arkansas better than cheese dip. Created here in the 40s by a man named Blackie Donnelly, credited to his restaurant Mexico Chiquito, the dish has become a Southern staple. 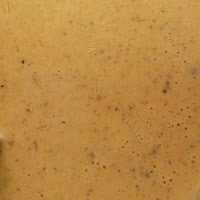 The simplest version marries Velveeta and Rotel together, two simple ingredients that dance well together. The recipes for the more complex recipes are hoarded away. Restauranteurs and families alike keep the secret to their cheese concoction to themselves. I've never found another state that offers so much, so many and so widely varied offerings of cheese dip as Arkansas. Strangely enough, I have yet to try a few on this list... but I'll update it when I do. Here's to dipping your chip. Arkansas Burger Company. Known best for its burgers (especially The Rock), ABC's cheese dip is consistently ranked among Central Arkansas favorites. 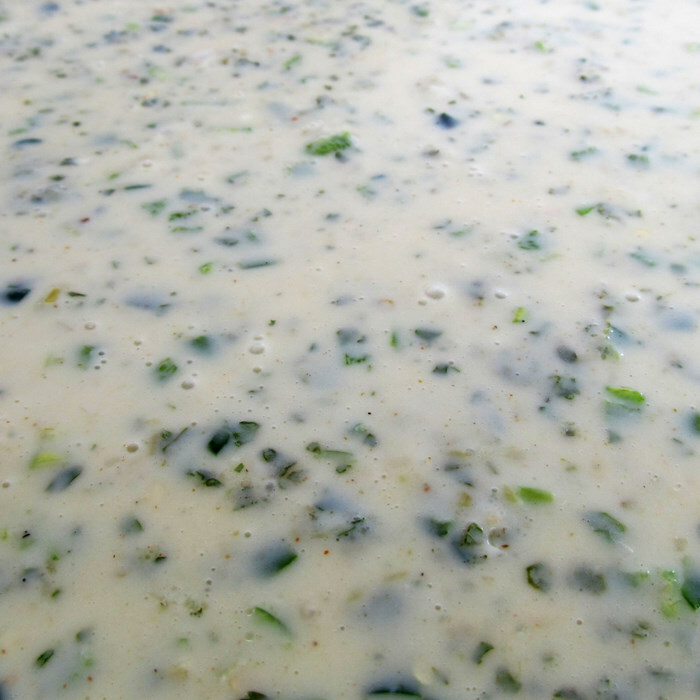 It's a white queso flaked with green jalapeno pepper bits, smooth with a bit of heat and well salted. It's served up with thick yellow tortilla chips; alternately, you can use the Lay's potato chips that go with your burger. It's located at 7410 Cantrell Road in Little Rock. (501) 663-0600 -- and check out the Facebook page. Yup, those are my photos, used with permission. Balcony Restaurant. 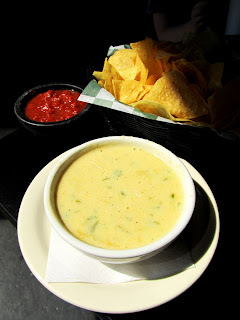 The chips and queso at this restaurant inside Eureka Springs' Basin Park Hotel is smoky, a little salty and quite yellow -- and it's accompanied by homemade salsa. The 1905 Basin Park Hotel is at 12 Spring Street, right next to (you guessed it) Basin Park. (479) 253-7837 or check out the restaurant website. Buffalo Grill. 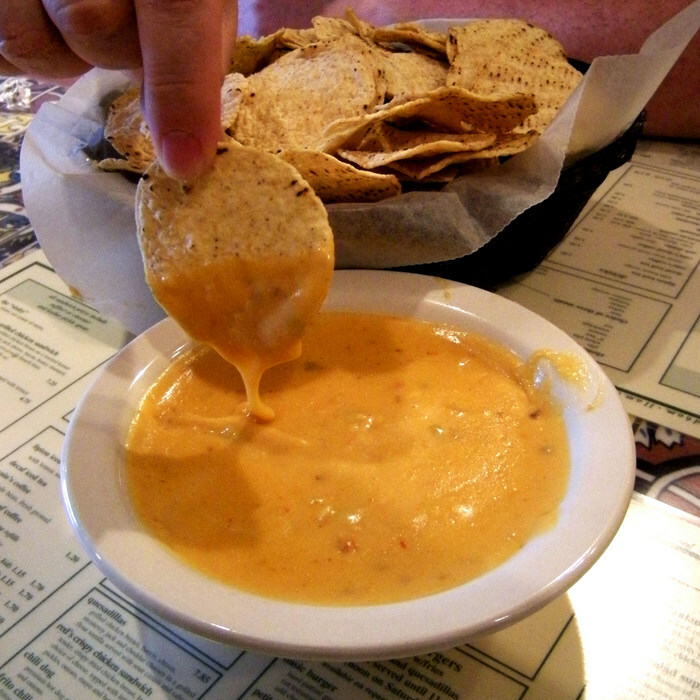 One of Little Rock's classic dips, the yellow dip is calm and mild and served up with big round yellow tortilla chips. For some reason they now serve the dip on the signature Tortilla Flats instead of cheese... but that's all right. 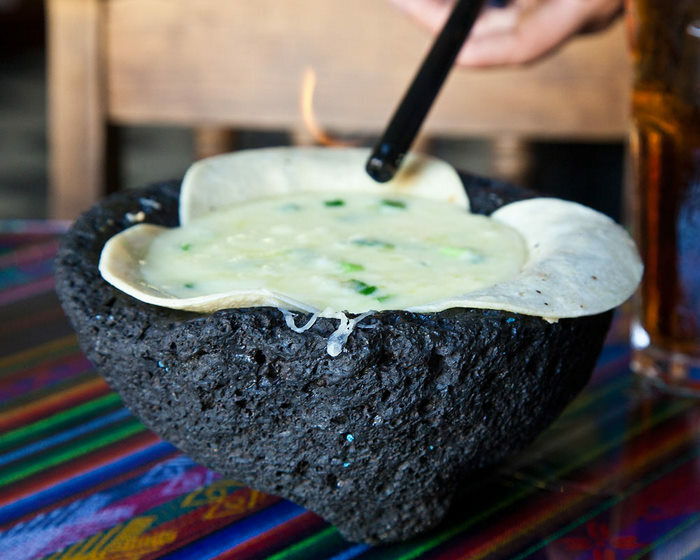 Perfect for dipping that quesadilla. And check out the restaurant website. Cactus Jack's. This average white dip comes close to white Velveeta, but somehow it's gained a following. Mild, creamy, completely expected, at least Cactus Jack's serves up thin and crispy yellow tortilla chips to go along with it. Casa Manana. Can a cheese dip go well with coffee? This one does. 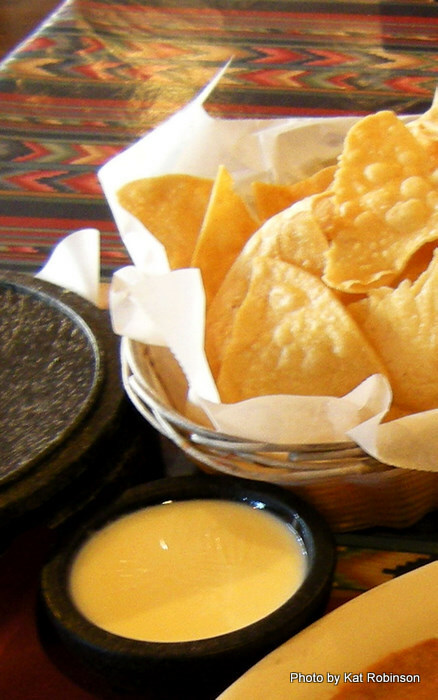 Casa Manana's reliable thick and creamy white dip has nice friendly notes of queso anejo and queso Chihuahua. It's also good poured over Huevos Rancheros. Served up with fresh-fried-daily corn tortilla chips and a salsa redolent of red bell pepper and cumin. Oppenheimer Market Hall at the River Market/(501) 372-6637. Cheddar's. Yes, it's a national chain. Yes, it's a Velveeta meets Rotel yellow. But they throw in ground beef for free... surprisingly, it's not strong on Cheddar, as you might think from the restaurant name. The chips are thin yellow tortilla, and the salsa is fresh and strong with cumin and onion notes. 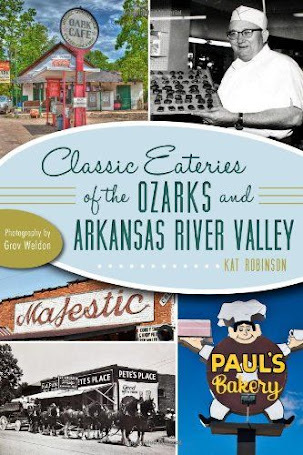 I'm just going to give you the website -- there are several locations in Arkansas with more as time goes past. Chip’s Barbecue. Chip's used to put smoked meat in their cheese dip, which was pretty good. They stopped doing that, but that's all right. It's a Mexico Chiquito style dip with lots of cumin and paprika and strong Cheddar flavors, with good cling for the house-fried thick tortilla chips served with it. I adore the fresh tomato salsa that comes with each order. Also great on fries, which is usually how I have it there. 9801 West Markham. Check out the restaurant website, too. Cow Pen. 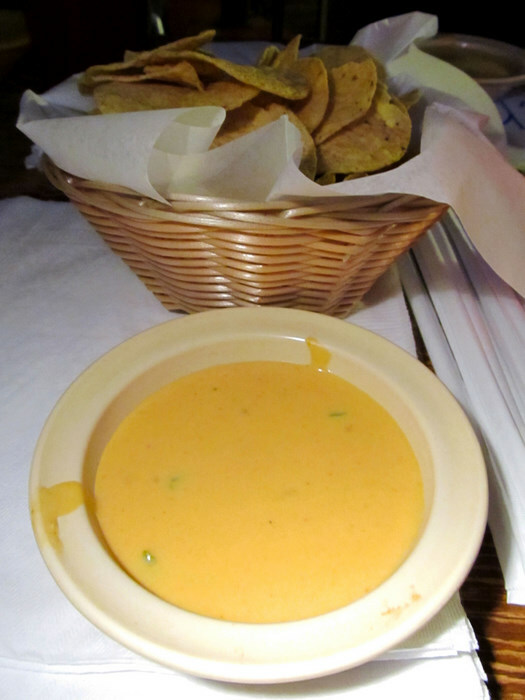 I don't know what's the better deal -- the cheese dip, the bean dip or the salsa that comes in the Chip & Dip ($6.95) at The Cow Pen in Lake Village. The yellow cheese dip is a Velveeta-Rotel blend but has an additional dairy element that makes it creamy. Spice is just right. The salsa is sweet and the bean dip is garlicky, and the whole affair comes with a picnic sized basket of thin tortilla chips. Highway 82 Bridge (Lake Village). (870) 265-9992. Check out the restaurant website. Cozymel's. The chain operation has a location in Little Rock off Markham at Shackleford. 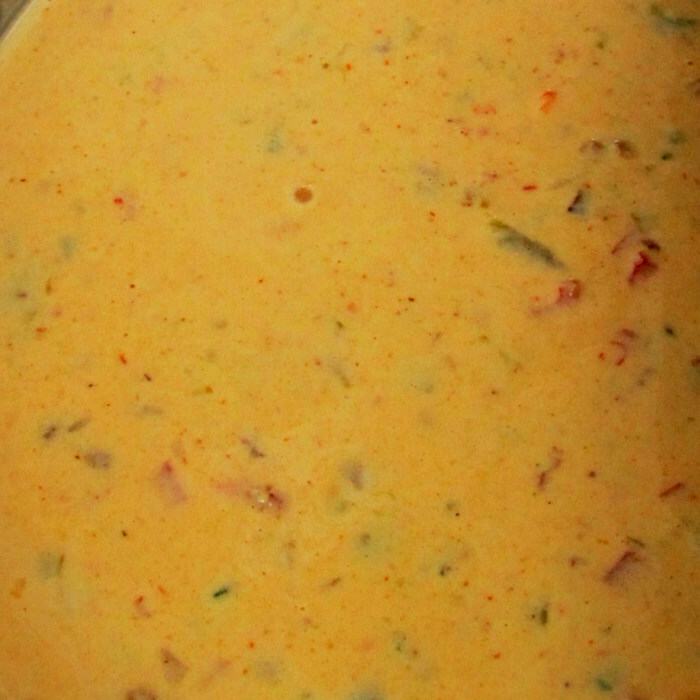 They call their cheese dip Chile con Queso, and describe it as a blend of mexican cheeses topped with pico de gallo. 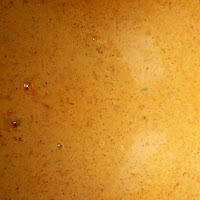 What they serve up is a strong yellowish-pink dip full of spices, very strong in flavor. It's pretty good. (501) 954-7100 or check out the website. Dizzy’s. 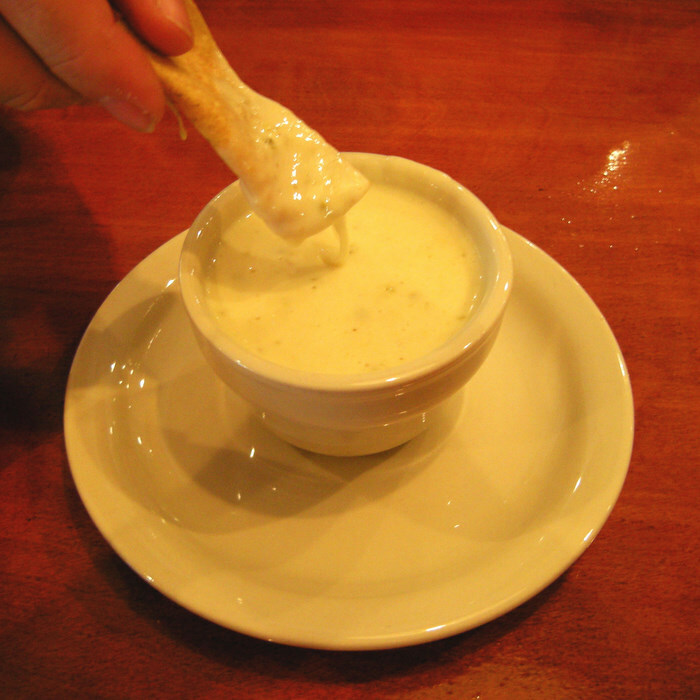 The restaurant's three-part dip won the first ever World Cheese Dip Championship; it went over so well, they replaced their old dip with it. It's a yellow dip chunky with onions and peppers and it's served up large. Dizzy's is in the River Market at 200 River Market Avenue #150. (501) 375-3500. They too have a website. Dogtown Coffee and Cookery. The 2011 winner of Best Cheese Dip at the World Cheese Dip Competition. 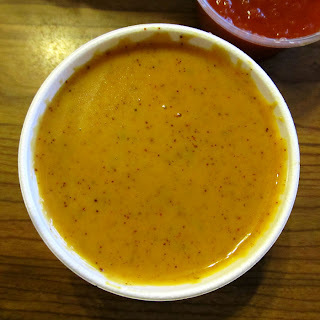 In fact, Dogtown had just opened up when they entered this dip, which is reminiscent of the famed Mexico Chiquito dip, full of spices and different cheese flavors. Definitely meant to be a classic. 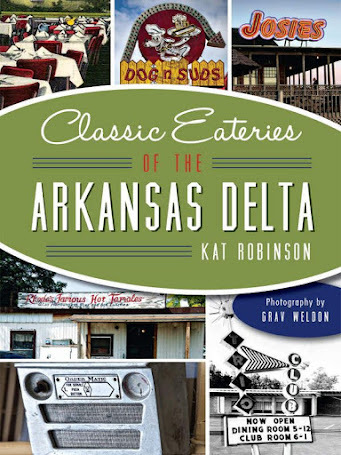 You'll find Dogtown Coffee and Cookery in Dogtown - er, Argenta, er, North Little Rock at 6725 John F. Kennedy. (501) 833-3850 or check them out on Facebook. Faby’s. The dip at Faby's is so thick, it almost doesn't qualify as cheese dip. Instead, what you get is a queso fundido, thick enough to eat with a fork, the sort of hot cheese sauce you want on a cold day. 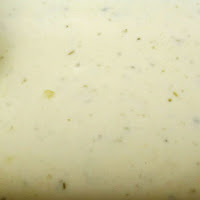 It's a blend of white Mexican cheeses that stands well on its own but is even better when ordered as fajita queso with chunks of beef or chicken. 2915 Dave Ward Drive in Conway, (501) 329-5151 -- and 1023 Front Street, also in Conway, (501) 513-1199. Flying Burrito. 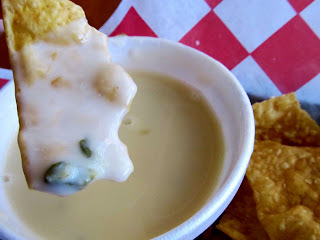 Jill, one of my travel writers, swears the cheese dip served up at the Flying Burrito in Fayetteville and Springdale is the best she's tried. 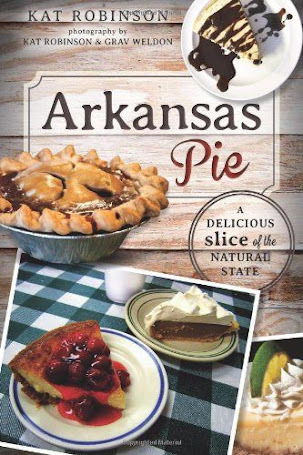 Since the one in Little Rock has closed, I am going to have to place a marker here for when I go try it in April. For now, go look at their website. Godsey’s Grill. 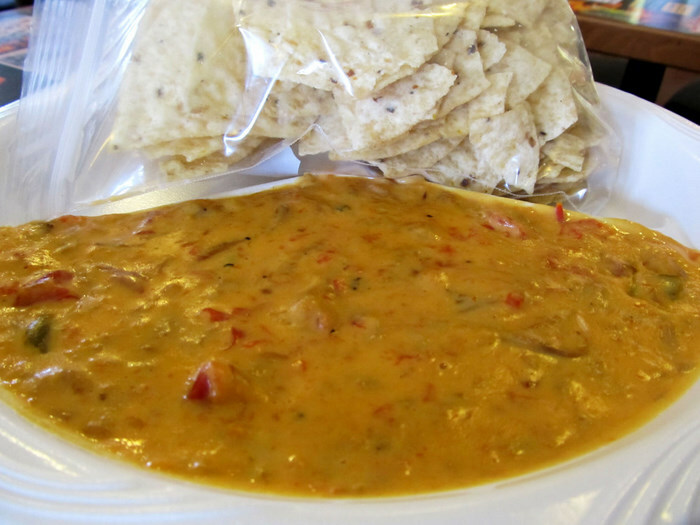 Godsey’s actually sells a traditional Rotel and Velveeta dip, along with about eight other dips. The Drunken Chicken dip includes smoked chicken -- and the Chicken Enchilada dip that comes so heavy on the spices you won’t be able to tell there’s Velveeta under the surface on those homemade potato chips. 226 South Main St. in Jonesboro. (870) 336-1988. And of course, there's a website. Hamburger Barn. The Arkadelphia mainstay still serves up the same sort of cheese dip you'd come to expect at any backyard barbecue -- the traditional straight-up Velveeta and Rotel dip. 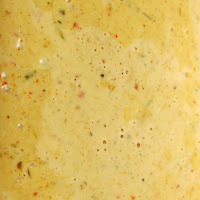 Goes well with the charbroiled burgers, tortilla chips, fries and onion rings. 2813 West Pine Street, (870) 246-5556. They're on Facebook. Izzy’s. You have to drive way out Cantrell Road to after it turns into Highway 10 to get out to Izzy's, but it's worth it. The dip is packed with white Cheddar, fresh tomatoes and spices, and manages to be pretty light. I like to order it up with the Big Tamale and salsa... and strangely enough, it's very good on saltine crackers, go figure. Izzy's is out at 5601 Ranch Road. (501) 868-4311. Check out the website. And have some tea there, too. Juanita’s. Remember that great white cheese dip from the Blue Mesa Grill? 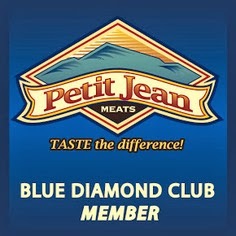 You can get it at Juanita's... it's almost as good as it was at Blue Mesa. 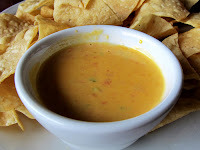 Of course, Juanita's has its own yellow Chili con Queso... which is decent. Just beware -- service at Juanita's sometimes seems to take a backseat to the venue's other attraction -- live concerts. You'll find Juanita's at 614 President Clinton Avenue in the River Market.. (501) 372-1228. And here's that website. Loca Luna. 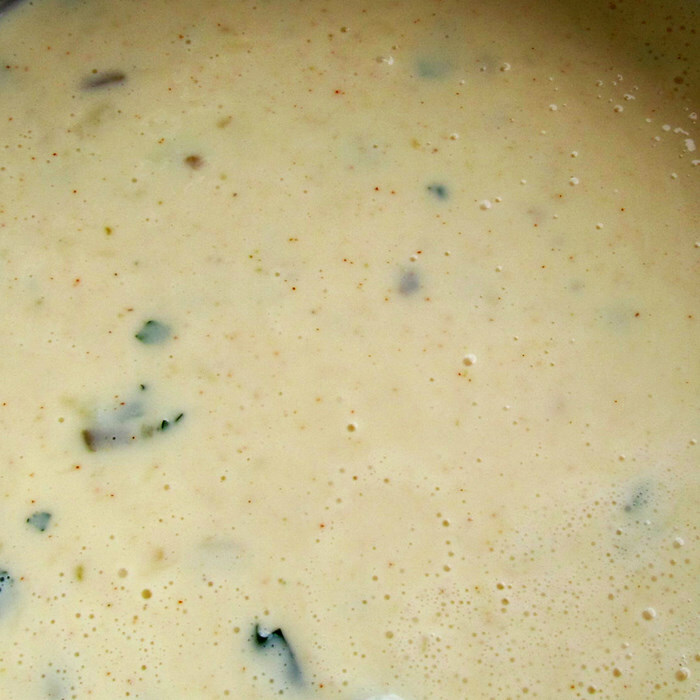 The Roasted Green Chile Con Queso is starting to gather a real following. It's sharp, spicy, fresh and served up with tricolor chips that somehow aren’t as colorful as that great queso flavor. 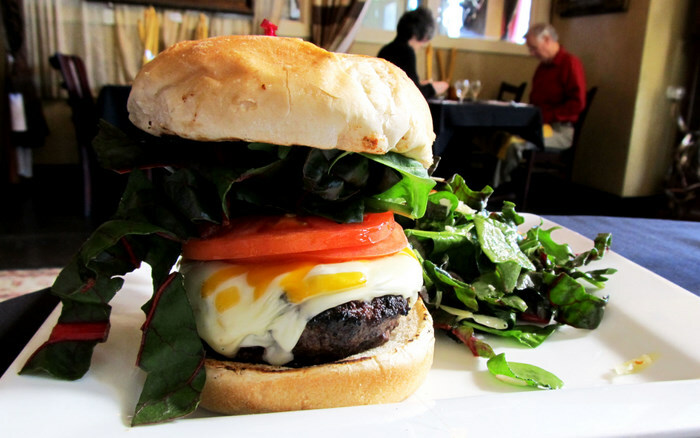 You'll find Local Luna at 3519 Old Cantrell Road. (501) 663-4666. Here's the website. Maria’s. 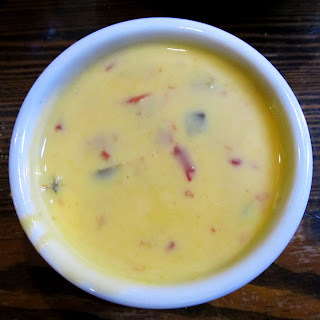 The smooth mild creamy Queso Blanco is the best cheese dip I've had in Fort Smith, with lovely complex flavors of Queso Asadero and, we suspect, some Jack cheese too. Just a tiny bit better than the Chile “Coin” Queso they also do. In addition to Fort Smith, Rogers, Bentonville and elsewhere. And then there's a website. Mean Pig BBQ. The barbecue joint best known for its Shut Up Sauce has one of the better quesos in the state -- a deep yellow dip inundated with shredded smoked beef brisket throughout, served with a zip-top bag of tortilla chips on a big plate. It is indeed a meal in itself. Still, make it healthy -- ask for a salad, too. Highway 321 just east of Highway 67-167 in Cabot. (501) 941-5489 or go to the website. Mexico Chiquito. Of course, it's the standard by which all other cheese dips are judged, the first and still the most elusive to pin down. 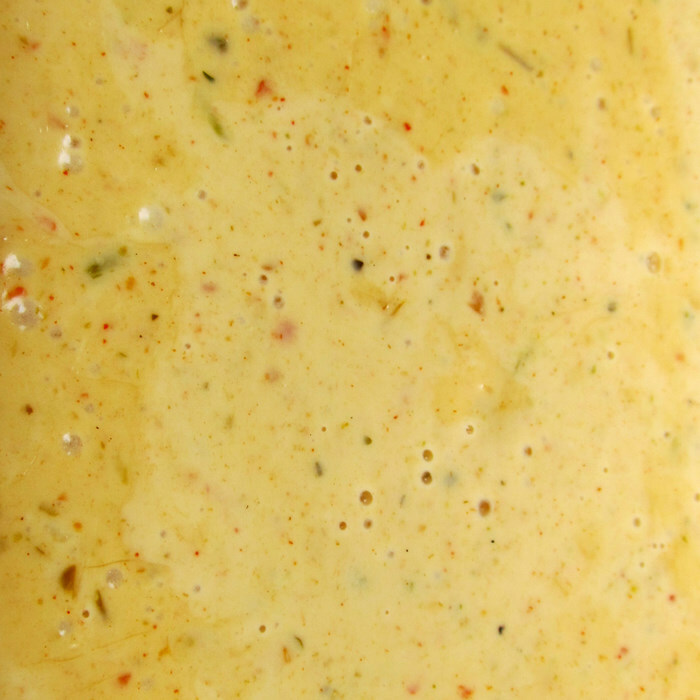 Created after a visit to Mexico and based on real American and Mexican cheese, the deep spice mix marks the uniqueness of its flavor with lots of paprika, cumin and heaven knows what else. Still as addictive as always. I'm just going to give you the website, since there are Mex-To-Gos everywhere now. south off I-40 exit 183 on Bankhead Drive in Carlisle. And here's that website. Pancho's. The only restaurant on my cheese dip list that serves their queso at room temperature. 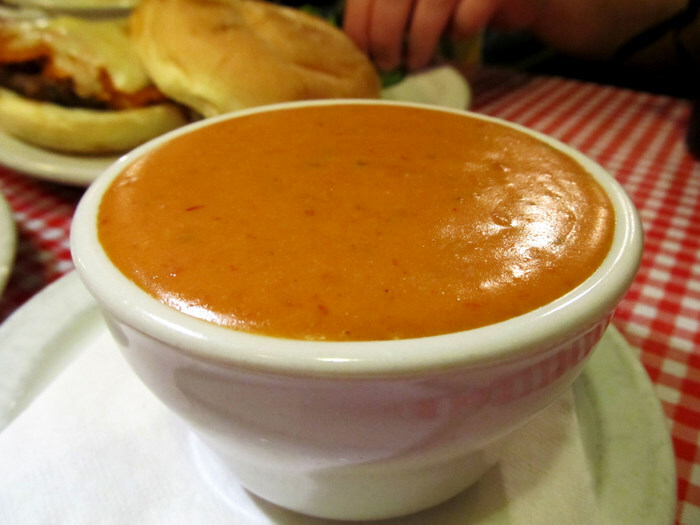 The creamy dip is extraordinarily mild; "hot dip" (a pepper sauce laced salsa puree) is brought to the table to add to get the right consistency. 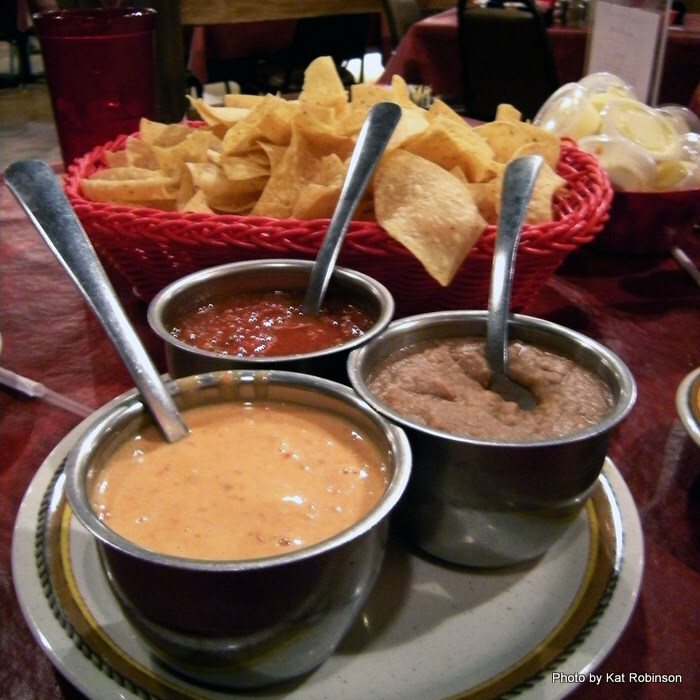 The hot dip is as spicy as the cheese dip isn't. Served up with tortilla rounds; you'll also find Pancho's cheese dip sold in original and white versions in some grocery stores. Pancho's is at 3600 East Broadway in West Memphis. (870) 735-6466 -- or get the dip here. River Rock Grill. Part of a dip trio, the chefs at River Rock Grill at the Winthrop Rockefeller Institute atop Petit Jean Mountain have created the closest dip to the famed Mexico Chiquito cheese dip I've found anywhere. 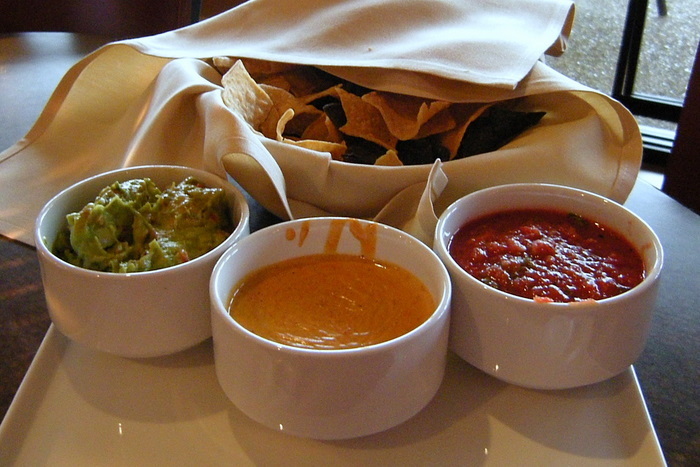 The salsa is chunky and spicy, the guacamole fresh and the chips thin. The problem is, the restaurant rarely seems open any more. 1 Rockefeller Drive (Morrilton). (501) 727-5435. Might check out the website or call first. Rolando’s. The Queso Flamado at Rolando’s is not only thick and hot, it’s on fire. As in, it's served flaming. With or without chorizo, this Monterey Jack cheese confection has amazing pull -- not just for its fabulous flavor but for the lengths you can pull the stringy cheese. 210 Central Avenue (Hot Springs), (501) 318-6054. 223 Garrison Avenue (Fort Smith), (479) 573-0404. 224 South 2nd St. (Rogers), (479) 621-1002. And of course, the website. Santo Coyote. Thin but packed with flavor, Santo Coyote’s light cheese dip matches its light and crispy housemade tortilla chips. 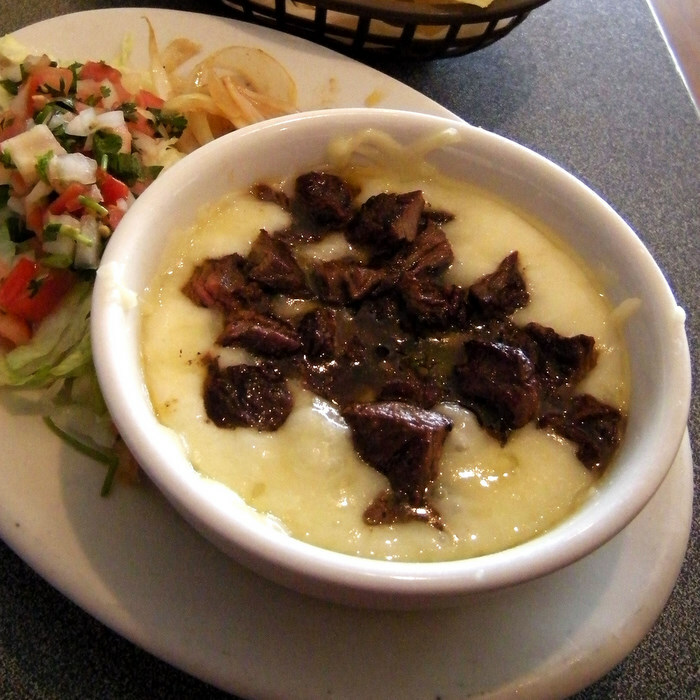 And you can get your dip full of stuff, like the El Santo Dip that's full of shrimp, chicken and beef chunks. You'll need a fork with that. They also have about 100 tequilas on board. 2513 McCain Blvd. (501) 753-9800. Senor Tequila. 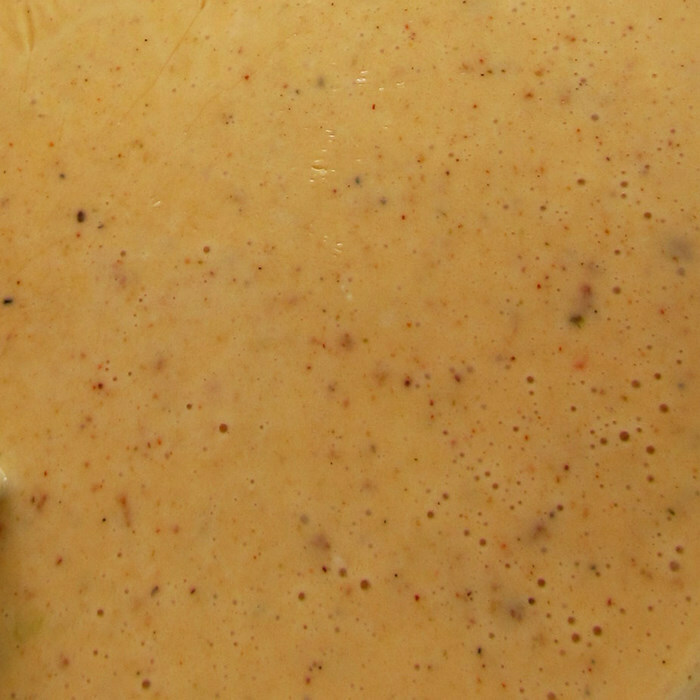 This cloying, almost sticky queso likes to grab your chip. 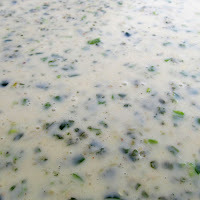 With excellent cling, it’s the perfect pungent dip for mixing with the restaurant’s lightly spicy cilantro-heavy salsa. Also good on the enchiladas. Multiple locations. Sparky’s Roadhouse Café. 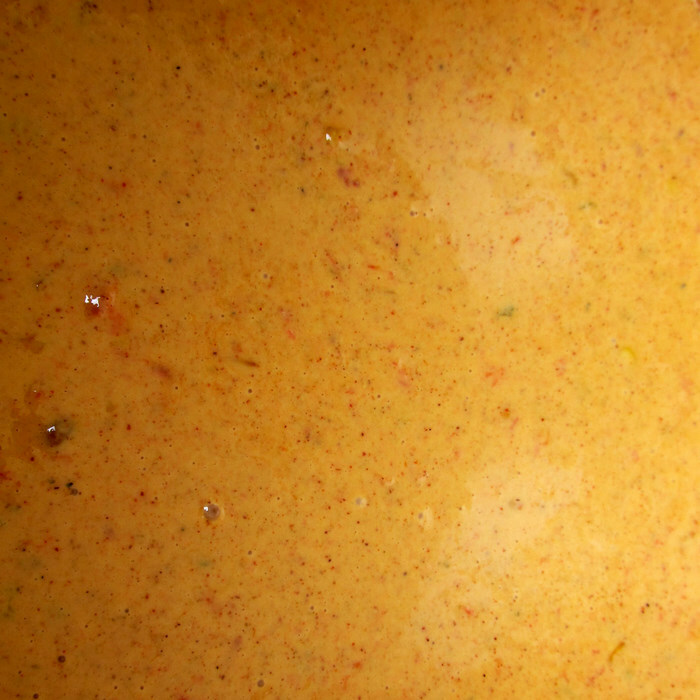 You can’t really call Sparky’s dip a yellow dip -- it’s actually Queso Rojo, a blend of cheese and spices so concentrated it actually appears an orangish-red, even redder the longer it sits. Sweet, salty, cheesy, complicated, it’s just about my favorite cheese dip in the state. Of course, I eat it with French fries. It's at 147 E. Van Buren in Eureka Springs. (479) 253-6001 -- and yes, there's a website. Stoby’s. The restaurant’s eponymous yellow cheese dip is a smooth, creamy blend of cheeses that’s almost sissy mild but also heavily addictive. It's so dang famous, American Idol star Kris Allen did a big call-out on it on that show -- and got free cheese dip for life. 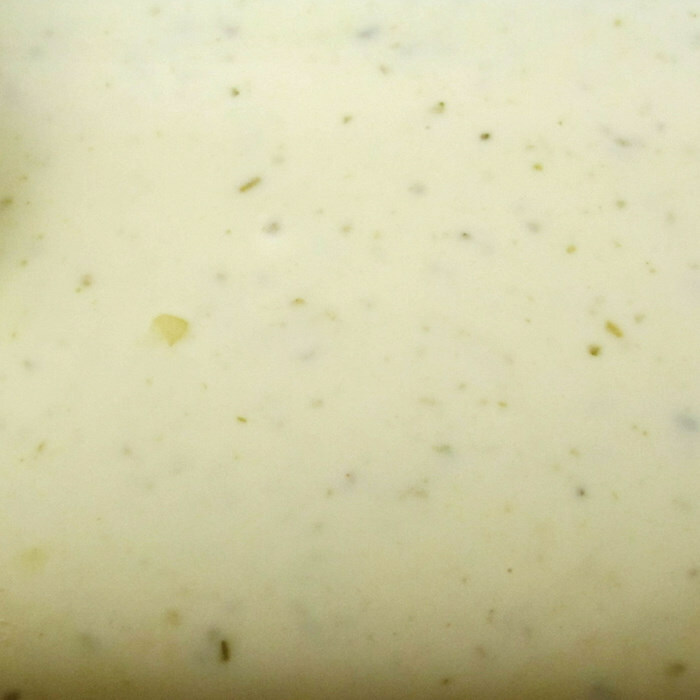 The newer white dip is spicier, with a long-growing heat from jalapenos under its smooth deceptive surface. Served on big round yellow tortilla chips. 805 Donaghey (Conway), (501) 327-5447. 405 West Parkway (Russellville), (479) 968-3816. Check out that website, too. Taco Villa. My old college favorite keeps winning more fans, thanks to consistent low prices and a family attitude. The smooth yellow cheese dip has a strong garlic flavor; thick tortilla chips are always on hand for dipping. Also good on the apple sticks, strangely enough. 420 East 4th Street in Russellville. (479) 968-1191. U.S. Pizza Company. 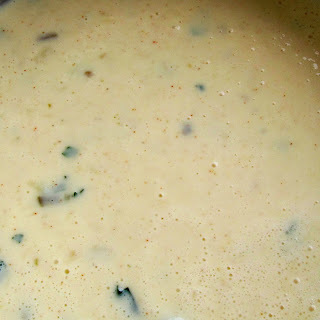 Judy’s White Cheese Dip isn’t just great on the thick tortilla chips that regularly accompany the bowl. It’s also popular with some customers served over salad instead of dressing. Creamy, mild and inoffensive -- it's a great white dip . Multiple locations. Check for them all on the website. 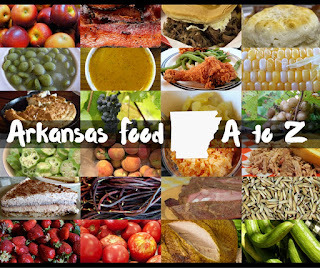 If you have an Arkansas cheese dip you feel should be on this list, drop me a line at kat@tiedyetravels.com or leave a remark in the comment section.